DS-2CE56COT-IRM is a waterproof camera with infrared technology with up to 20m range. It provides high quality image even in no-light conditions. Mechanical IR-cut filter. Aluminium body suitable for indoor and outdoor mounting. Vandal proof. 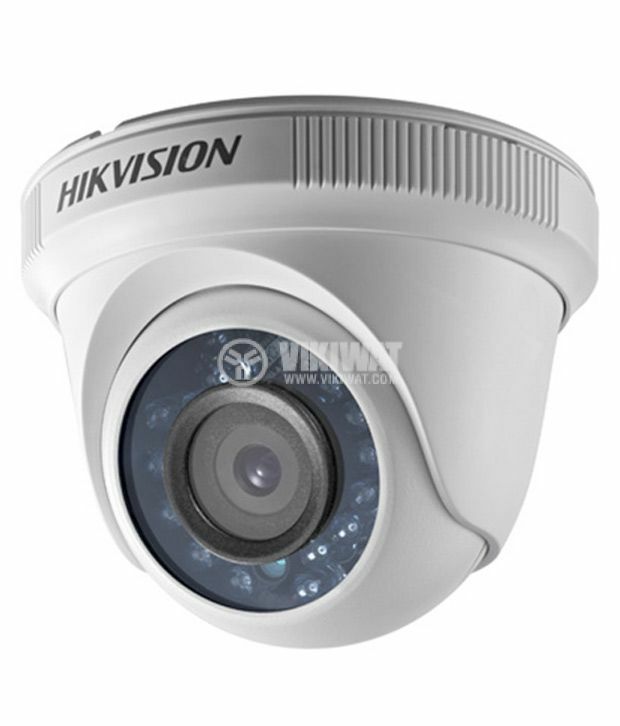 Dome camera suitable for both indoors and outdoors for surveillance in public and commercial buildings. IR illuminator for day and night conditions. The camera can be connected to DVR devices. As the camera has focal lens, it makes it suitable for panoramic and perimeter video surveillance. After its installation, manual settings can be made using the lens. The camera can transmit high resolution video, audio, data. The DS-2CE56D1T-IRM camera works in color mode during the day. The infrared illuminator is on when there is no enough light. The camera body is water- and dustproof. For surveillance through internet, you can use HDTVI DVR recorders. iVMS is a free software of HIKVISION designed for mobile phones to remotely monitor live videos. It's available on Google play.